Meet Raúl Xavier. The 25-year-old was one of hundreds of followers of Pastor José Julino Kalupeteka, the Angolan founder of a breakaway Adventist sect called ‘Christian Church of the 7th Day – Light of the World’. Raúl Xavier was one of the first to run to Pastor Kalupeteka’s aid on April 16, 2015 when provincial police officers, backed by special units from the Angolan army, attacked the sect’s camp in the rural village of São Pedro de Sumé, in the central Angolan province of Huambo. Nursing a wound after a bullet went through his right ankle, he ended up witnessing what has become known as the ‘Mount Sumi Massacre’, from his hiding place on the rooftop of Kalupeteka’s house. On April 5, 2016 – just eleven days short of the first anniversary of the bloody events on Mount Sumi – Pastor Kalupeteka was sentenced to 28 years in prison by the Huambo Provincial Court, for the part he is alleged to have played in the murder of eight police officers sent to arrest him. Credible accounts from eyewitnesses, recorded by a parliamentary delegation and journalists suggest that upwards of 700 adherents of the “Light of the World” religious sect were slaughtered that day in revenge for the killings of at least eight policemen sent to arrest Kalupeteka, who were beaten to death by his followers. 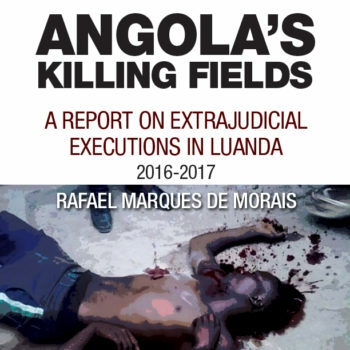 This is the first of a series of accounts by survivors of that massacre that Maka Angola will be publishing as a contribution to a better understanding of what really happened that day. Raúl Xavier had dressed that day in jeans, a black shirt and jacket and his football boots. He was outdoors, chatting with fellow believers in the shanty of zinc-roofed huts that sprang up to house those who took refuge on Mount Sumi. Sect members, fearing persecution, flocked there to be close to Pastor Kalupeteka. A group of believers armed themselves with staves and any other objects they could find at hand (to protect the Pastor). Raúl says the group sang a hymn as in desperation they ran towards their death against the police officers’ bullets. “When the believers saw that the police were shooting at them, they launched themselves against them. God himself was there. God alone. They [the police] were shooting at us and we could see the smoke from the gun barrels. But we couldn’t see any bullets” says the young man. Raul says he watched the frenzied beating meted out to one policeman as he begged for his life. He was shouting: “Don’t kill us, we are only following orders.” But the mob kept on beating him to the ground, with some falling as the volley of bullets kept hitting them. Around 8pm on the same day, three [Russian-made] Kamaz trucks carrying dozens of soldiers from the Angolan Armed Forces (FAA) arrived at the village, to reinforce the PIR operation. He started to fret. Where was his 24 year-old wife, Avelina, whose pregnancy was at full term? Where were his children: 6 year-old Nandinho and 3 year-old Ismael? He says he was more concerned for their safety than his own life. “About then, along with Samy who had taken a bulletin to the right side of his chest, I climbed onto the zinc-panels of the roof of the prophet’s home. We hid there.” He says the bullet that hit Samy was never removed to this day. Watching the horror unfold, Raúl Xavier and Samy decided to risk an escape. During the night of April 17, more than 24 hours after the violence began, they climbed down from the roof. As they made their way up the mountain, they passed one of the sect’s plantations and were able to grab seven ears of corn, two pumpkins and some potatoes that had been left to roast in one of the field ovens on site, and were still warm. After a day hiding in bushes, furnished with this rudimentary picnic, the pair found a place of safety where they spent the next seven days. “God is the one!” says Raul Xavier over and over. That is his only explanation for how Samy, with a bullet lodged in his chest, and he himself with a broken ankle, managed to survive. They spent the night on the summit, scared by the frequent helicopter flights around and about. At dawn, they made their way to Coquengo, on the north flank of the mountain. For two weeks, the two companions stayed alive by foraging for raw honey, manioc and guavas. They camped out near a water source, where the ground was flat. Finally, on the last day “we saw soldiers carrying goods they had looted from Mount Sumi”. The only other soul in sight was a local collecting firewood out in the open near their hiding place. With soldiers and a local so close by, Raúl Xavier feared for their safety. “I had two (mobile) phones with just a tiny amount of charge left on the battery. I was able to make a call to our Brothers, and tell them where to find us. We made our move while it was still daylight but God was protecting us. No-one noted our presence there and so we were able to get away,” he concludes. Happily, Raúl Xavier was able to find his wife, Avelina, in the city of Huambo and meet his newborn son, Nunda, for the first time. On the day of the killing his wife had escaped, walking through the night with a group of fellow believers to the main town in Cáala municipality. They found refuge at the home of fellow believers but the very next day she went into labour and gave birth, only to be denounced by an informer. Together with the other sect members, she was detained by the police. The men were taken away while the women waited to be punished. But she was lucky: some of her fellow believers gave her 1,000 kwanzas to pay a car to take her to the provincial capital.